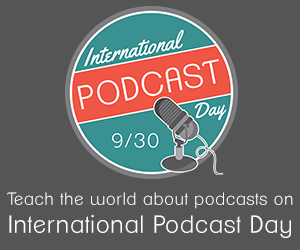 International #PodcastDay is Almost Here: Start The Conversation! If you’ve ben looking for an excuse to crow about your podcast, here it is: International Podcast Day, a day “dedicated to promoting podcasting worldwide through education and public engagement,” is coming up soon: this Friday, September 30, and there is a two-day educational event to accompany it starting on Thursday, September 29. Started by Modern Life Podcast Network founder Steve Lee in 2013, the event aims to raise awareness about podcasting and its potential for entertainment and education. Blubrry is the Platinum-level sponsor for International Podcast Day 2016, and several team members will also be presenting. All presentations will be streamed live on Firetalk. CEO Todd Cochrane will be speaking about “Podcast Audience Engagement and Metrics that Matter” at 8:00 PM PST on Friday, and will also be on the closing panel with Steve Lee at 11 PM PST Friday. Blubrry team members MacKenzie Bennett and Angelo Mandato will present on “From Branding To Promotion” at 10 AM PST, covering details like branding, optimizing your podcast feed, and successfully promoting your podcast using winning artwork, podcast players, subscribe tools, and more. Other notable presenters include Gary Leland & John Lee Dumas, Kathryn Bryant, and Annie Sargent. Pre-registration isn’t necessary: just check out the event list and show up to whatever grabs your interest! Most of all, be sure to spread the word: after all, the point of International Podcast Day is to spread the word about this great medium. We’ll see you there!